Easily amongst the coolest and toughest actors in film, Danny Trejo is undoubtedly one of the most recognisable faces in the action genre today. With a variety of credits to his name including Desperado and Heat it comes as no surprise the veteran of the industry is still enjoying success today with the Machete franchise as well as other films. He even inspired us to look at ten of his compadres in the arena of cinematic badassery yesterday. We chat with the man himself, a one-time resident of California’s infamous San Quentin prison, about his new film Bullet. HeyUGuys: How does it feel to be a cult icon? Well, you know they say I’ve gone from ex-con to icon. I’ve got to keep myself in check, I am just a worker. Everybody knows me from my job and it’s a blessing. [Bullet] is a story about a cop getting ready to retire whose grandson gets kidnapped when they’re at the park. But it’s a ploy to get the bad guys son out of prison. It’s a really exciting movie. What seems to attract you to these roles? They’re not boring. I hate drama. I hate movies that have a little bit of action and then drama then some action. In a movie like Bullet you can’t just go and get a beer otherwise you’re gonna miss something. How do you feel actions films have changed over the years? If directors try to stick to the format of Clint Eastwood’s Dirty Harry or Charles Bronson Death Wish then you can’t lose. Those were magnificent movies that you could watch all day long. Bullet is trying to do the Death Wish type thing, in the way that my character is determined and going to win no matter what. Have you done any of your own stunts in your films? First of all, let me say this. Insurance companies will not let you do your own stunts. I wouldn’t want to risk it. You know if I get injured then that’s going to shut down production and that’s risking 120 peoples jobs just so I can say I have big nuts. You hear a lot of actors say they do their own stunts. I am like shut up, man. If I am an investor with money invested in a movie then I don’t want guys doing their own stunts so they can go and brag about it on the Tonight Show or whatever. You’ve become a bit of an action film legend and pretty much done it all. But is there anyone in particular you really want to work with? I’ve worked with so many people. I love the work I do and do the work I love. A lot of times I don’t know who the star of the movie is. I just show up and make sure I know my lines! Who have you been most star struck by? Robert De Niro. We did Machete together and when I seen him he was like “Danny, you’re number one on this one and I am really proud of you”. I just looked at him right in the eyes and asked “Would you like me to get you some coffee, Mr De Niro?” To have him say that was a life defining moment for me. He’s such a real icon. You don’t happen to do a De Niro impression, do you…? Was there any one moment when you knew you had made it as an actor? You know what’s funny; my mum never thought I had a real job even when I would say I was doing movies. She would just say get a job but then I did three episodes of The Young & the Restless. After that she was in tears as though I’d won an Oscar and told me how she watched it with all of her friends. I was like, okay, now I’ve made it. 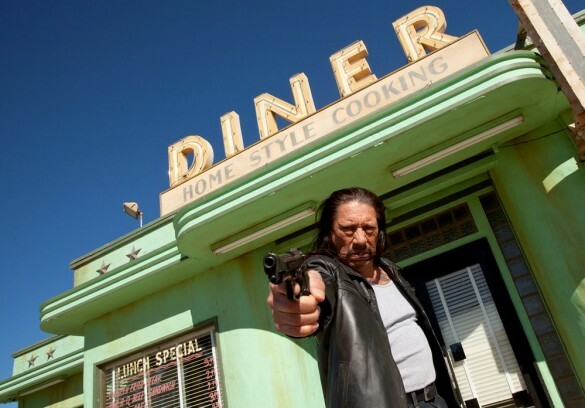 How surprised were you by the success of Machete with fans and the box office? A little. My mum started calling me Machete and a lot of people out in the streets as well. I even think we’re going to be doing Machete Kills in Space.